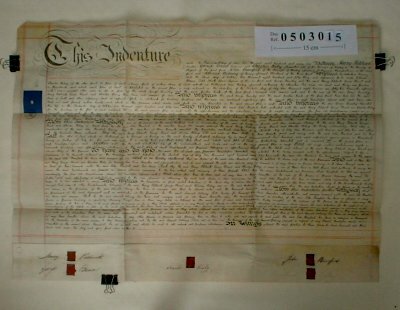 Parchment : 1 sheet 54cm x 75cm with 5 wax seals and revenue stamp. Henry PIDDUCK of Hanley, Staffordshire. Jeweller. George BRUNT of Hanley, Staffordshire. Engraver. Charles RABY of Hanley, Staffordshire. Shoemaker. John BAMFORD of Hanley, Staffordshire. Earthenware Manufacturer. Samuel ASBURY of Hanley, Staffordshire. Merchant. The document begins by reciting an Indenture of 1853 in which a plot of land totalling 5 acres in Northwood, near Hanley, Staffordshire, was bought by George Yearsley, Henry Pidduck, George Brunt and Charles Raby. We are told that the land has since been laid out in building plots with access roads. George Yearsley has since died, and the remaining 3 owners are selling one of the plots (numbered ' 111 ') to John Bamford for £21/4/-d. The only part which Samuel Asbury plays in the contract is that he undertake to produce an earlier indenture at any time if required in order to establish title to the property.